avocation agreed with him, as he added Judge Parker in 1952. Apartment 3-G was the third and last of his comic strip creations — but apparently his favorite, as it was the only one he continued writing when, in 1990, he retired from Morgan and Parker. All three started out at Publishers Syndicate (Tales from the Great Book) but are now distributed by King Features (Flash Gordon). Apartment 3-G opened on May 8, 1961. Its inhabitants were three young and very realistically-portrayed working women — a blonde (schoolteacher LuAnn Powers), a brunette (actors' agent Margo Magee) and a redhead (medical woman Tommie Thompson). Their soap-style adventures in New York City, which often include their avuncular neighbor, Professor Aristotle Papagoras, have held readers' interest in more than 100 newspapers, for the past five decades. Alex Kotzky, who drew the strip for more than three of those decades, started out in comic books, where he illustrated such diverse features as Blackhawk and Plastic Man, and had a hand in creating Quality Comics' Manhunter. He later worked in newspaper comics, assisting Milton Caniff on Steve Canyon and Stan Drake on The Heart of Juliet Jones. For Apartment 3-G, he chose a photo-realistic style, unlike most of his earlier work, but very much in tune with the prevailing trend in comic strip soap operas such as Mary Worth and Friday Foster. 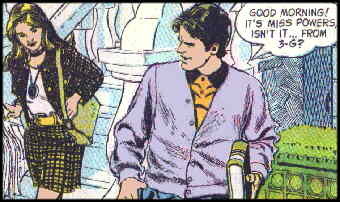 When Dallis died, in 1991, he began writing the strip as well. Kotzky died in 1996. Apartment 3-G is now written by Lisa Trusiani, who has credits at both Marvel and DC, and drawn by Frank Bolle, whose extensive comics experience runs the gamut from Winnie Winkle to The Heap. After all these years, Apartment 3-G is still shared by the same three women — who don't seem to have aged a bit, by the way. The Professor is still living in their building, still ready with fatherly advice. And readers still love to follow their story. Text ©2001-10 Donald D. Markstein. Art © Publishers Syndicate.